Welcome to our African violet website! We are pleased to present to you our newest introductions for 2019. As always, we have included many of our favorite older varieties of African violets, as well as varieties from other hybridizers too! We offer many types of gesneriads, as well as several other choice, exotic and unusual "companion plants" and a small selection of terrarium plants. You can now place your order using our convenient on-line shopping cart system. See the Ordering Information page for details. For those of you who are considering placing an order with us for the first time, rest assured we are a nationally known and trusted company. We ship plants all over the world, with one goal in mind — to provide you with top-of-the-line varieties, most of which are developed right here in our greenhouses. Order with confidence, knowing that your plants will be properly handled and packed by our staff with the greatest care. We receive many letters and email messages from our customers, complimenting us on our packing techniques and the condition of their plants upon arrival. Our greenhouses are filled with an even larger selection of African violets and gesneriads, plus many other exotic houseplants and orchids too numerous to list. Our personal orchid collection is on exhibit year-round. Cameras are always welcome! If you are traveling near our area (Dolgeville, New York), please come see us. We are currently in our Spring/Summer shipping season. Winter shipping usually goes in effect around November 15th, depending on the weather conditions. If the weather is unusually warm, we can extend summer shipping rates a bit longer, especially in the warmer southern states. If the weather is unusally cold, winter rates may take effect earlier than November 15th. Please Note: Orders placed during late April and early May, can take up to 3 or 4 weeks to be delivered, due to a rush of orders taking place once we have returned to Spring/Summer shipping rates! Once that backlog of orders are shipped, usually by the end of May, orders usually ship out within 1 week. 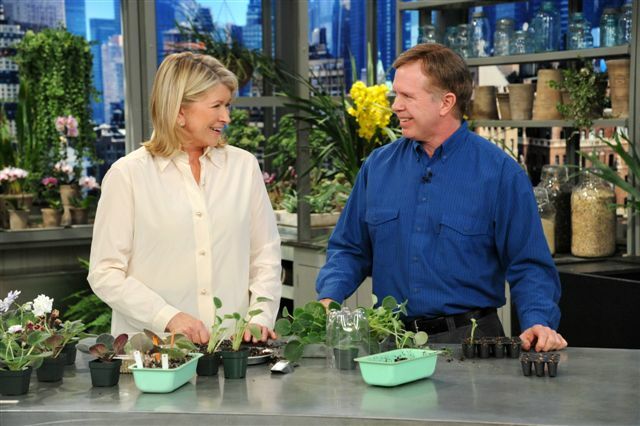 Paul Sorano appeared in a segment on the Martha Stewart Show on Tuesday, February 7, 2012, representing Lyndon Lyon Greenhouses. They discussed the various types of African violets, how to repot a plant with a neck, and how to propagate from leaves. Watch a YouTube video of the segment.